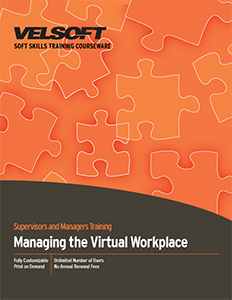 Managing the Virtual Workplace Training Materials are designed for trainers to develop supervisors’ and managers’ ability to provide Managing the Virtual Workplace to their employees. Teach management when Managing the Virtual Workplace is needed, how to develop communication strategies, the six characteristics of Managing the Virtual Workplace and more! Seeing is Believing This sample manual to teach Managing the Virtual Workplace is in MS Word format. Each component is fully customizable, meaning that you can create a unique course every time you train. Or, just take the materials and train! See how easy it is today with a free sample.